The skill of numerical weather forecasts (forecasting by computer) generally has been increasing since its inception. Even so, a numerical weather forecast for a particular place and time can be frustratingly wrong. One of the reasons for this is the errors in the initial conditions, which refers to the best-guess estimate of the state of the atmosphere at the time the computer forecast begins. Initial condition errors arise from, among other things, errors in the observations of the current state of the atmosphere (e.g., instruments have errors) and incompleteness of the observations (e.g., we don’t observe the current state of the atmosphere at all places, especially over remote areas such as oceans and mountainous regions). Decades ago, it was discovered that even slight alterations in our best-guess estimate of the current state of the atmosphere could lead to computer forecasts that diverge. In other words, two computer forecasts that start with slightly different initial conditions will produce different forecasts for the same place and time, increasingly so as the forecast progresses in time. 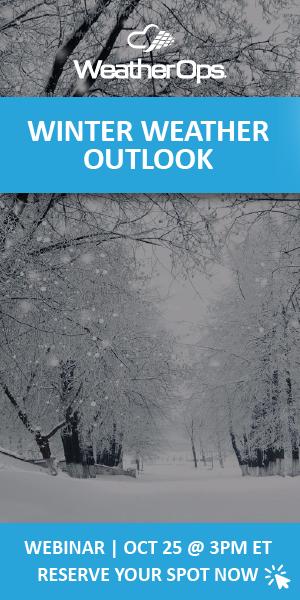 This doesn’t exactly inspire confidence in the weather forecast, does it? Ensemble forecasting was born to help address this problem. Ensemble forecasting is a forecasting method in which multiple forecasts (an ensemble of forecasts) are produced. If, for example, minor adjustments are made to the initial conditions that are used at the beginning of computer forecasts (e.g., modifications to temperature, humidity, wind speed, and direction), then a different forecast is produced. If multiple sets of minor adjustments are made, then an ensemble of forecasts can be generated. From an ensemble of forecasts, forecasters can compute, for example, the minimum, maximum, and average of each forecast variable (e.g., surface temperature) for a particular place and time. If the spread of the forecast ensemble is small—suggesting that the ensemble members are in close agreement—then the forecaster can be somewhat confident that the forecast will be somewhat accurate. Similarly, if the spread of the forecast ensemble is large—suggesting that the ensemble members are dissimilar—then the forecaster generally has little confidence in the forecast. The former usually occurs during the early part of the forecast period, whereas the latter often occurs during the final days of a multi-day (e.g., 7- or 10-day) computer forecast. Ensemble forecasts also can be used to determine the probability (likelihood) of an event or condition occurring. 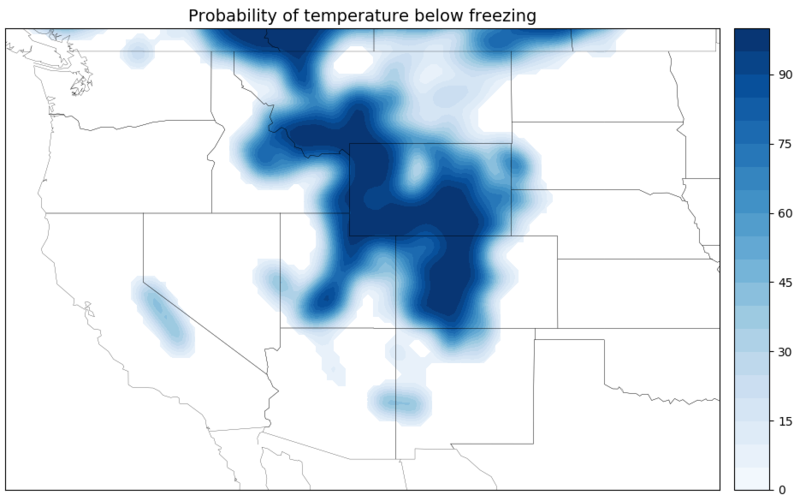 For example, the transportation and agriculture sectors may be interested in the probability of the surface temperature dropping below freezing (see figure below; computed from an ensemble of 51 members). 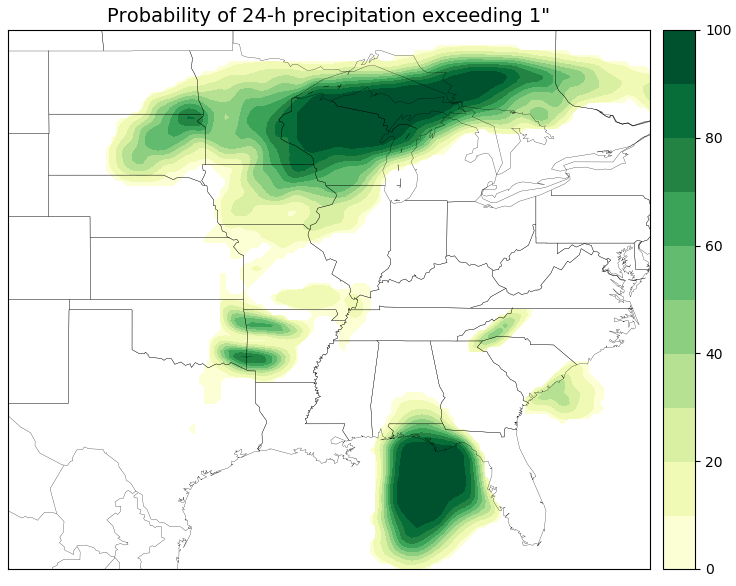 The agriculture industry also may be interested in the probability of rainfall exceeding a particular threshold over a specified period (as seen below; computed from an ensemble of 51 members). Wind energy companies may be interested in the probability of the wind speed exceeding certain thresholds; of course, many more examples exist. Our 24/7 WeatherOps Forecast Team uses ensemble forecasting in a variety of ways by using different weighting and other techniques to produce probabilistic based forecasts, issue confidence levels, and identify areas or assets that may experience weather impacts beyond the traditional 7-day forecast range. Ultimately, these ensemble based forecasts help our clients make critical weather-related business decisions, such as when to take delivery trucks off the road when winds reach a certain threshold or when to shut down operations in advance of a tropical cyclone threat.